I am in love with eggs baked in tomato bases. 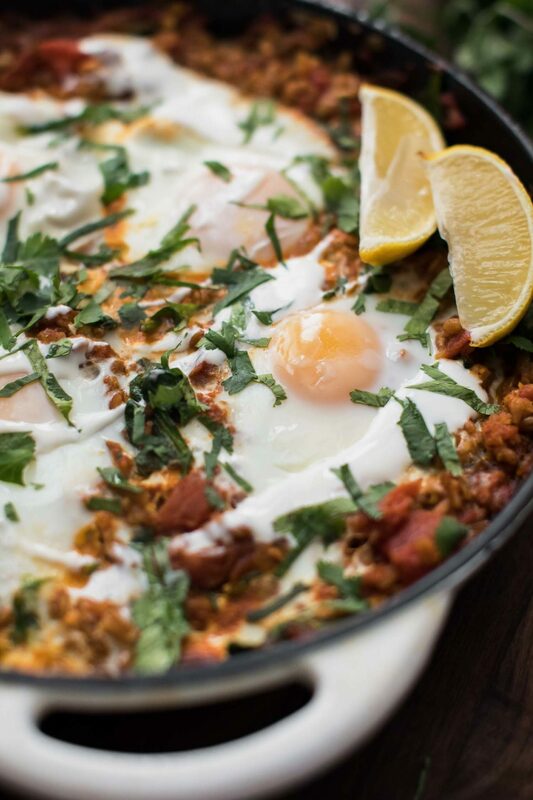 Give me a solid Shakshuka with some crusty bread any day of the week. 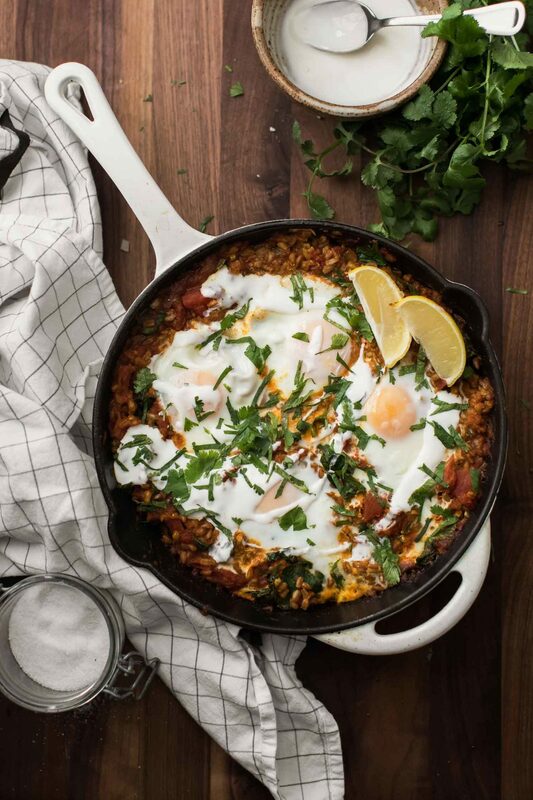 This farro skillet is inspired by the traditional Shakshuka but the farro plays a large role in the substance of the dish. Also, I use a Ras El Hanout spice blend (also from a similar origin as Shakshuka). I love how the warming spices from the blend work with the tomatoes and nutty flavor of the farro. It’s a solid breakfast but it’s also one of my favorite dinner recipes. Best of all, this recipe is perfect if you have leftover farro from the day before. It makes this meal fairly quick and a perfect weekend breakfast or weeknight dinner. A wonderful spiced egg skillet featuring farro, tomatoes, and Ras El Hanout. Place farro in a dry pan over medium-low heat. Toast the farro until fragrant, 3 minutes or so. Combine the toasted farro with 2 cups of water and a pinch of salt. Cover and cook until farro is tender; 35 to 35 minutes (depending on if you’re using pearled or unhulled- check your package, the time with change). Drain any excess liquid and set aside. Heat a 10” skillet over medium-low heat. Add the olive oil followed by the red onion. Cook until the onion is tender and fragrant; 6 to 8 minutes. Stir in the garlic and cook for one minute more. Stir in the tomato paste and spice blend. Warm to combine then add in the stewed tomatoes. Cook for roughly 8 to 10 minutes, letting the flavors come together and allow the tomatoes to break down. I like to help the tomatoes along and crush the tomatoes with the back of my spoon. Crack an egg into each well. Cover, reduce heat to low, and cook until the egg whites are set and the yolk is to your liking; 10 to 12 minutes for over-easy. If the whites aren’t setting and your pan is broiler-safe, stick the pan under the broil for 30 seconds or so (this will also set the egg-yolks faster/harder to get runny eggs. Once the eggs are set, serve with a drizzle of yogurt, cilantro, and lemon wedges as desired. This recipe is wonderful to adapt. Use different greens, flavors, or even make it vegan. This dish, in some variation, is on our table nearly every week. Greens: swap the spinach for you favorite greens: kale, chard, or collards would all work well. The heartier greens will need a bit more time to wilt- plan to stir them in about halfway heating the tomato mixture. Spices: Don’t want all the flavors from the Ras El Hanout? Go a more traditional route with cumin and paprika. Vegan: Skip the eggs and serve the dish with your favorite non-dairy yogurt. I’ve also been known to stir in a cup or so of cooked chickpeas towards the end to bulk up the meal.